I fell in love with both of these because I'm a sucker for texture. The Robert Rodriguez top I just purchased is black, so you would assume it was very plain, but it is extremely interesting. The front is draped in a very cool way and the sleeves are absolutely amazing. 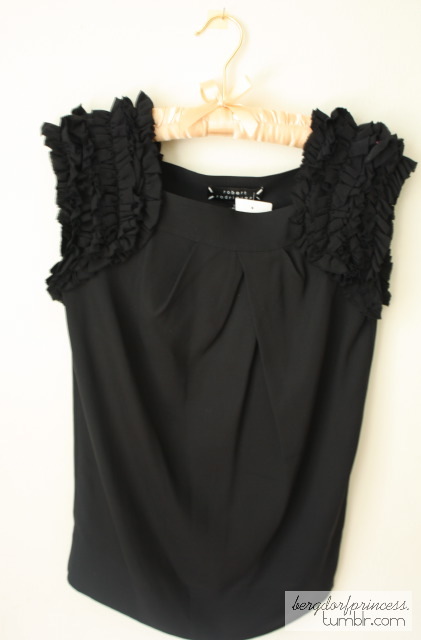 It's a great staple piece in that it is a black top that will match anything, but it is also a stand-out piece. The red Joie blouse above is one of my favorites. I paired it with black wool tights, black Michael Kors flats (not shown), a black pleated skirt from Theory, and my Chanel. The tank top I purchased feels very nice. I love silk! Friday was my mom's birthday, and I figured I'd share what I got her. I love giving gifts and searching for the right gifts for people. It's so much fun! My mom has been needing a new bag for work for a while, so with the help of my amazing best friend Audrey, I found her this pebbled leather black Coach tote for $52. Also, hooray for birthday flowers! Finally, I ordered myself three v-necks from Everlane, just to have. They were free because I had credit for the website. I'm excited for the weather to get warmer so that I can wear my favorite skirts. 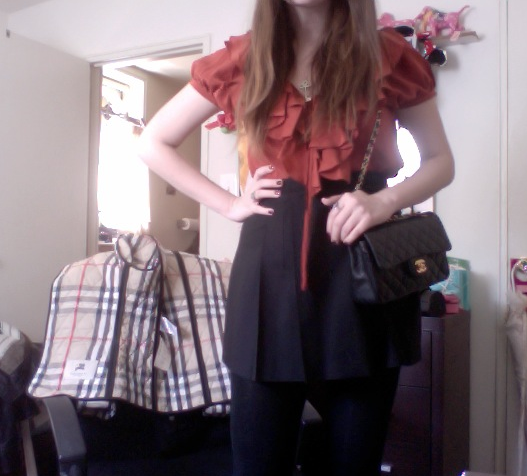 Here is a Marc by Marc Jacobs skirt I have, paired with my favorite Tibi blouse. J'adore this color combination! hi, I know you live in New York, I was there a few days ago and purchased my Le Pliage at the Longchamp store in Madison Ave. It was on sale, so I pretty much paid US$97 for medium bag and US$116 for the large one. I think it was a pretty good deal considering both cost more than US$120. I love your blog, keep up with the good work. I love what you said about Coach! I feel the exact same way. those are some pretty awesome items! I particularly enjoy the red joie outfit you created. looks so lovely. i do have to ask, totally unrelated, but how is it you have reply to comments on blogger? did blogger decide comments could be replied to, or is this a third party java app? Cute outfits, cute clothes, and a cute gift!